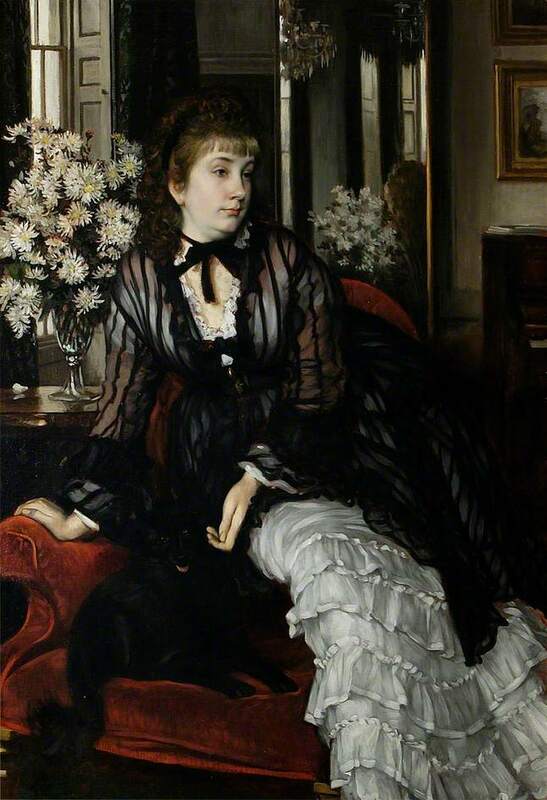 The memory of an English gentlewoman painted by James Tissot survives in the large portrait he was commissioned to paint of her by his young friend, Thomas Gibson Bowles (1841 – 1922). After the horrors of the Franco-Prussian War and its bloody aftermath, the Paris Commune, Tissot arrived in London in May or June, 1871 with less than one hundred francs but with numerous British friends including Tommy Bowles. Bowles had founded a new Society magazine, Vanity Fair, which débuted on November 14, 1868. By September 1869, Tommy Bowles was paying Tissot to provide caricatures for his magazine. He initially paid Tissot ten guineas for four drawings, but when circulation skyrocketed within a few weeks, he increased Tissot’s compensation to eight pounds for each drawing. When Tissot moved to London in 1871, Bowles, who was living at Cleeve Lodge, Queen’s Gate, near Hyde Park, let his friend use his rented apartment in Palace Chambers at 88 St. James’s Street. Tissot sold caricatures to Vanity Fair and painted on commission. Tommy Bowles was the illegitimate son of Thomas Milner Gibson (1806 – 1884), a Liberal MP for Manchester and President of the Board of Trade from 1859 to 1866, and Susannah Bowles, a servant. Tommy was an adorable little boy, and his stepmother, Arethusa Susannah (1814 – 1885), a Society hostess who was the only child of Sir Thomas Gery Cullum (1777 – 1855) of Hardwick House, Suffolk, insisted that he be raised with his father’s family of four sons and two daughters. Tommy’s favorite half-sister was Sydney Milner-Gibson, nearly eight years younger, and in 1871, when Sydney was 22, he commissioned Tissot to paint her portrait. Some scholars deduce it was a late 21st-birthday gift, and that milestone may well have been the reason for the commission. It may also have provided the perfect opportunity for Bowles to help Tissot establish himself in the London art world. Since Sydney Milner-Gibson was the granddaughter of a baronet, the portrait commission would have been a real coup for a French artist little known in London. In 1880, the unmarried Sydney died of enteric fever* – typhoid – at Hawstead, in Suffolk outside Bury St. Edmunds, two days after her thirty-first birthday. Tommy Bowles named his first daughter after her: Sydney (1880 – 1963), later Lady Redesdale, who was the mother of the famous Mitford sisters. Sydney Milner-Gibson’s younger brother, George Gery Milner Gibson, died unmarried in 1921 and bequeathed most of the family portraits to the Borough of St. Edmundsbury. From 1923 to 1959, Sydney’s portrait was displayed in the town library, and later at the Art Gallery. 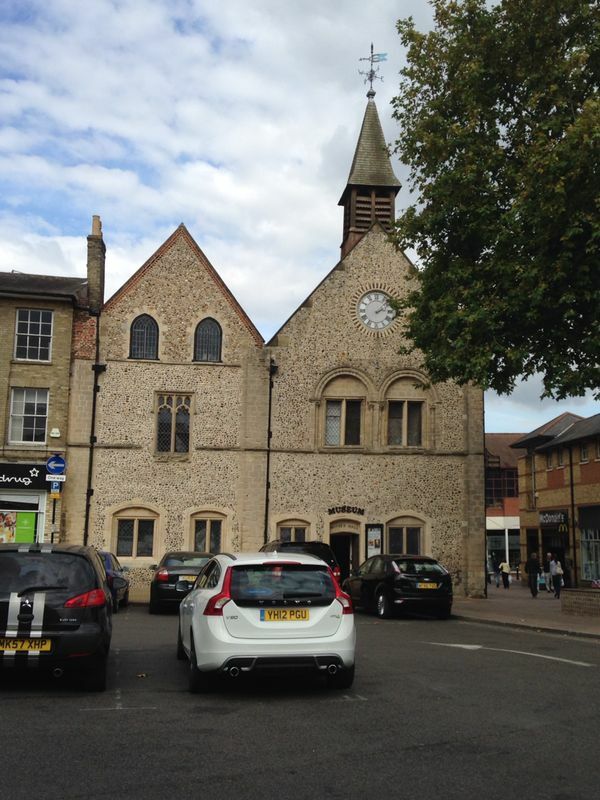 It was displayed at the Clock Museum, Angel Corner, in Bury St. Edmunds from 1989 to 1992, and then at the Manor House Museum until it was closed in 2006. Since 2012, the painting, which was valued at £1.8 million and cannot be sold, has been displayed at Moyse’s Hall Museum. James Tissot’s portrait of Sydney Milner-Gibson currently is displayed in the Edwardson Room first floor gallery, where I recently saw it after a quick train ride from Cambridge. Tissot captured the sweet, reticent personality and awkwardness of Tommy Bowles’ beloved little sister. Every detail of her portrait is beautifully painted, from the reflection of her hairstyle in the mirror behind her to the gown and its ruffles, and the vase of flowers on the right. At the very least, the display of Sydney Milner-Gibson’s portrait at the Royal Academy exhibition would have been Tissot’s entrée into the lucrative world of aristocratic British portraiture dominated by his friend John Everett Millais. But had Miss Milner-Gibson been a more attractive, confident and stylish young woman – and had Tissot had time to finish her portrait in time for the Royal Academy exhibition that year – no doubt this picture would be more well-known. Perhaps it might have created a sensation, as did Portrait of Mlle. L.L. 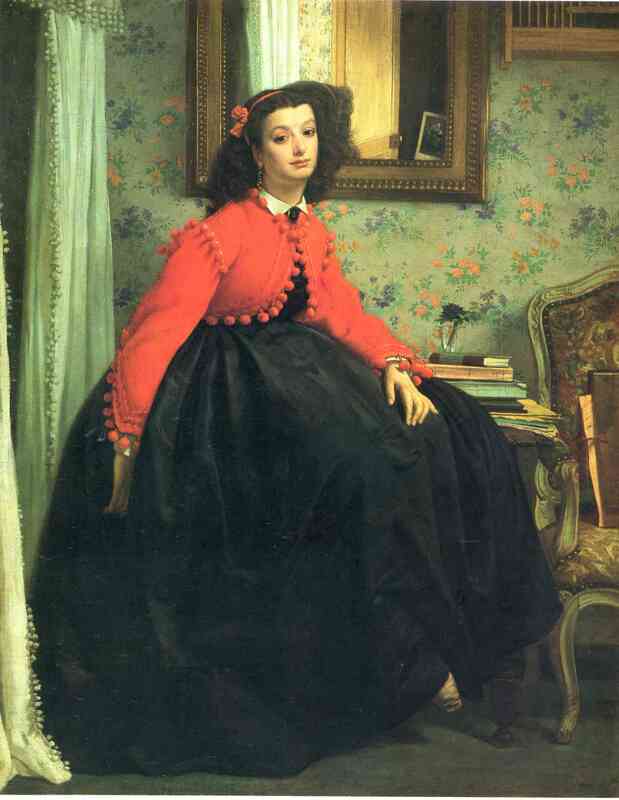 (Young Lady in a Red Jacket), which Tissot painted in Paris in February 1864 and exhibited at the Salon that year. You can view a photograph of Sydney by cutting and pasting this link into your browser: http://www.burypastandpresent.org.uk/bg/BRO_K505_2992.jpg. 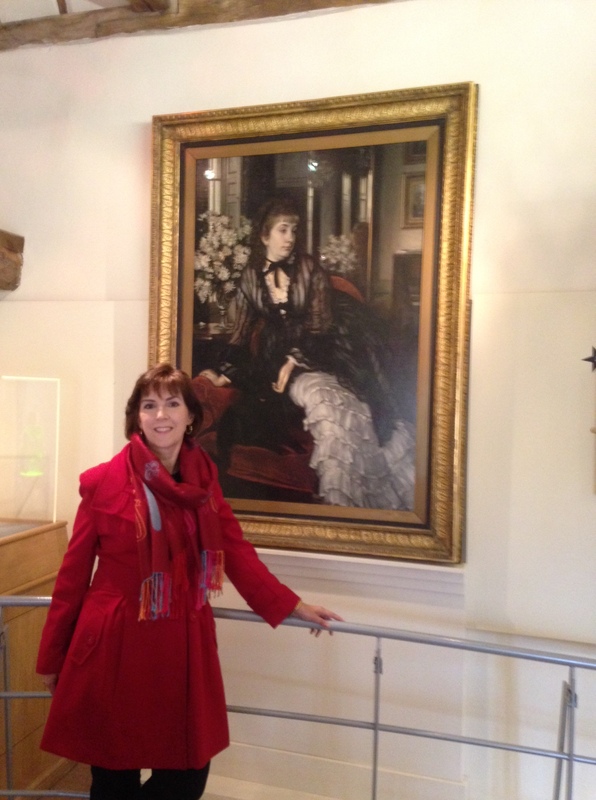 Sydney Milner-Gibson appears in my novel, The Hammock, with Tommy Bowles as James Tissot paints her portrait in 1872. Click the Amazon link below to immerse yourself in their world! Note:* Previously, scholars reported that Sydney Milner-Gibson died of tuberculosis. However, a copy of Sydney’s death certificate was sent to me by reader Adam Mead of Bristol, U.K. Adam blogs on the Milner-Gibson family at https://milnergibson.wordpress.com/2013/08/03/the-milner-gibsons/. Thank you, Adam! This entry was posted in Art blog, Art History, Impressionists and tagged James Tissot, Sydney Milner-Gibson, Thomas Gibson Bowles on October 10, 2014 by Lucy Paquette, author of The Hammock: A novel based on the true story of French painter James Tissot.